1/2 teaspoon salt -- use 1/8 if using salted butter. Measure the flour and put it in a large mixing bowl. Mix the flour, sugar and salt very well in the bowl. Shred the cold butter over the flour. Toss everything together lightly with a fork to keep the butter bits separate. Using your fingers, lightly work the mixture into a coarse meal. Add about 3 tablespoons of water and mix with a spoon or heavy duty scraper. Keep adding water until dough just barely comes together. Dump the mixture onto a big sheet of plastic wrap and press it all together a little tighter. It shouldn't crumble at this point. Wrap in plastic wrap and let it rest in the refrigerator for at least 30 minutes. When ready to roll, set the dough on top of piece of lightly floured parchment paper or plastic wrap, then put another sheet of parchment or plastic wrap over the dough and press it down slightly. If the dough cracks, let it come to room temperature. I find it easier to deal with while cold, though. Roll into a large (12 inch) circle. Peel away top layer (bag or parchment) and transfer to the pie plate. 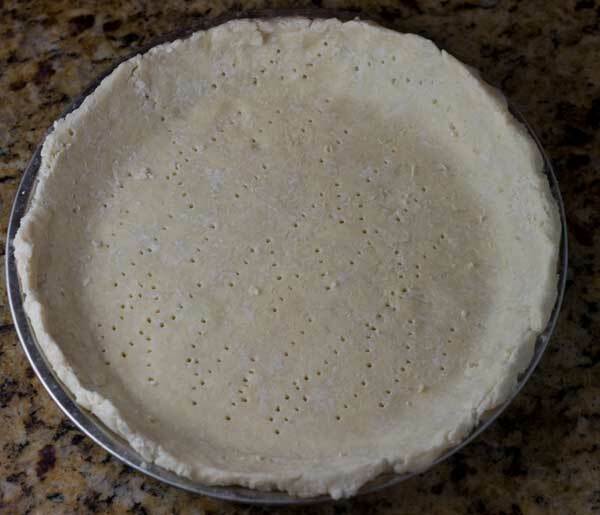 You can do this by folding the circle into quarter and transferring it with a scraper or you can set the pie plate upside down over the circle and flip, so that the crust goes into the pie plate. This can be messy, so do it over the sink. Very carefully peel it away. If your crust starts to tear as you peel off the parchment, put it in the freezer for a few minutes and then peel. Once parchment is peeled away, crimp the edges of the pie and put the crust covered pie plate back in the refrigerator for about an hour. The point is to keep it cold and relax the gluten so it won't shrink. To blind bake, cover cold pie crust with greased foil or parchment, add pie weights and bake covered at 375 F for 20 minutes. Remove weights and foil and continue baking for another 15 minutes or until lightly browned. Another recipe you can use is 1 cup AP flour (4.5 oz), 1/3 cup cake flour (1.3 oz), 1/2 teaspoon salt, 1/2 tablespoon sugar, 1 egg yolk, 4 tablespoons of water (or as needed) and 1/2 teaspoon of vinegar. Follow same steps as above, but mix yolk, water and vinegar together add a few tablespoons at a time until dough comes together. This makes a slightly more golden, puffier, crust.